The Ferragamo name has long been associated with the height of Italian luxury, from the iconic designs of Salvatore Ferragamo to the Lungarno Collection of boutique hotels owned by his family. Just steps from landmarks such as the Uffizi Gallery and the Duomo, Hotel Continentale houses a haven of tranquility at White Iris Beauty Spa, tucked away from the bustle of Florence. Set within Hotel Continentale, White Iris Beauty Spa combines the grandeur of Italian fashion’s golden age with contemporary design elements for a relaxing spa experience in the historic city. The warm Italian soul of Lungarno Collection is carried out through expert beauticians and therapists in a space of wellbeing and world-class hospitality. White Iris’s spa menu includes a range of lavish spa rituals as well as skin care, body treatments, toning, manicure and pedicure services, many incorporating products from the Comfort Zone skin care line. Beat jet lag by booking the rest-inducing Tranquility Pro-Sleep Ritual, which acts on three different sensorial pathways (olfactive, tactile and hearing) to provide a good night’s sleep to even the redeye traveler. The Tranquility Pro-Sleep treatment achieves a sound sleep through an exclusive blend of essential oils, a scientific sound technique inspired by Indonesian massage practices, and the use of soft brushes to aid in recovery from a long-haul flight. To feel rejuvenated in the morning, try the Recover Touch Facial which uses an antioxidant vitamin treatment with goji berries to revitalize and nourish skin. If you’re staying on site, reserve the beautiful Penthouse Consorti atop the medieval Consorti tower. 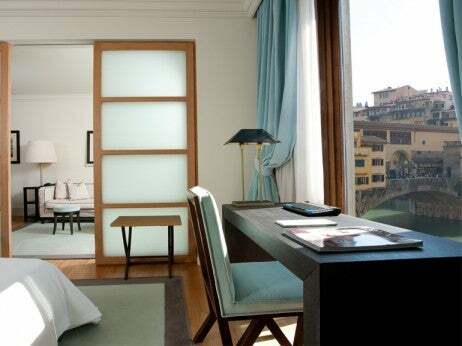 From the second floor, the suite overlooks the Ponte Vecchio, Arno River, Palazzo Brunelleschi and rolling hills. While White Iris Beauty Spa is located in Hotel Continentale, guests from any of the surrounding upscale Lungarno Collection properties — Portrait Firenze, Hotel Lungarno and Gallery Hotel Art — are welcome to indulge in its array of spa services. Hotel Continentale, Lungarno Collection, is located at Vicolo dell’Oro, 6r, 50123 Florence, Italy. For more information, please visit lungarnocollection.com.